We love interlocking concrete pavers. There, we said it. When deciding to replace or add a new walkway or patio area to your home, be sure to choose the best material for the job. Why should you choose concrete pavers for your Dutchess County walkway or patio? A much better alternative to poured or stamped concrete, pavers are a perfect choice for walkways and patios here in Dutchess and Orange County, NY. With the harsh NY winters, concrete pavers prevent cracking and the system is allowed to adjust with the freeze/thaw climate we live in. And nothing quite adds curb appeal like removing an old concrete walkway and replacing it with a vibrant new paver path. How did these Hopewell Junction, NY homeowners add amazing curb appeal to their Hudson Valley Home? For this featured project, these Hopewell Junction, NY homeowners had an extra special element for creating instant curb appeal—mature plantings. 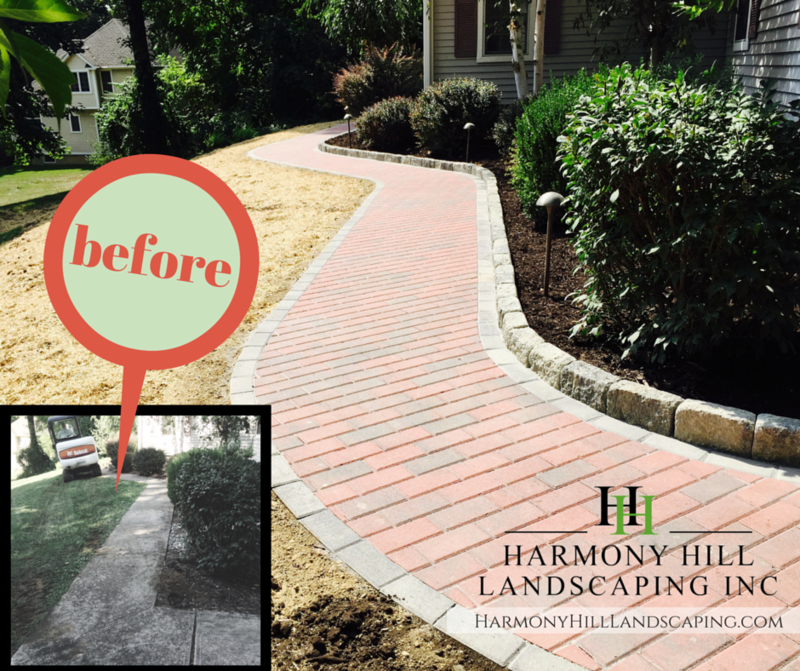 The team at Harmony Hill Landscaping loves to work on properties with well designed plantings that have had many years to mature beautifully. Although the crew must be more sensitive to ensure they don't disturb the existing beauties, once the walkway, patio, or outdoor kitchen is completed, the impact is immediate. Add landscape lighting for extra safety and beauty. A newly installed low voltage landscape lighting system completes this front entrance, bringing added function and security. Path lights manufactured by Cast Lighting in NJ line the walkway, spreading gentle lighting across the pavers. Landscape lighting is quite beautiful to experience and adds incredible resale value to any home.